Before purchasing a property to renovate you will want to work out if the renovation will be profitable in the first place. This small step can save you thousands of dollars down the road. It’s very important that you do your figures up front so you understand whether this is going to be a profitable investment and whether or not it’s going to be worth the time and the money that you put into it. 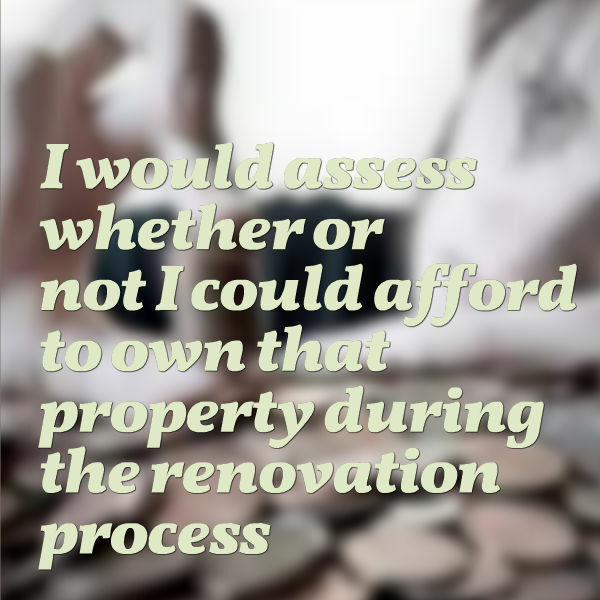 What I want to talk specifically about is how to assess a property that you intend to renovate. Firstly let us look at what most people do with a property they intend to renovate and that is to sell the property. This is the most simplest analysis to do and something that most investors will be looking at when they’re talking about renovation. 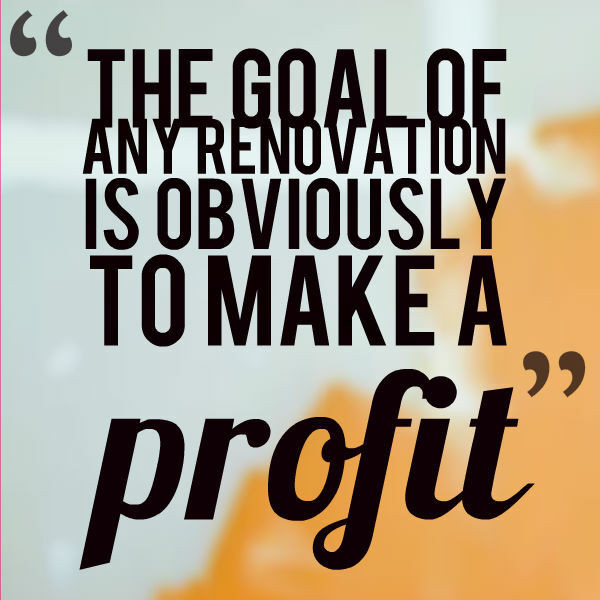 The goal of any renovation is obviously to make a profit. Depending on how serious you are a lot of people look at the percentage of return on total investment that you’re going to get. To get this figure you combine the purchase price with the renovation costs to get your starting figure. You then work out how much growth you achieved (or want to achieve) compared to this starting figure. So is it going to be 10% of the total investment, 20%, what is it going to be? But I think for most people starting out what they want to know is how many dollars they are actually going to get out of the property. To do this all you need to do is look at your purchase cost, so this includes the purchasing price but also includes things like stamp duty and legal fees and those sorts of things. Then you’ve got your holding costs, so these are things like mortgage you’re going to have to pay while it’s being renovated, paying all your council rates and insurances and then you’ve got your actual renovation cost and this is what you’re spending and actually bringing the property up to speed. What you do is add all of your costs together and then you work out how much the property is going to sell for and you minus those costs from the sale price and that gives you your profit. How Will A Renovation Be Profitable If Renting The Property? However when renovating to rent out a property the analysis is going to be a bit more difficult because you’re not just flipping the property and it’s not such an easy calculation to do. Can You Afford To Own The Property During The Renovation? The thing I would look at if I was going to go ahead and renovate a property is first I would assess whether or not I could afford to own that property during the renovation process. I would try to assess how long it’s actually going to take me to get this done. You need to know that when you’re holding a property and when you’re renovating it and it’s not rented out all of the holding costs associated with the property are still there. You still need to pay your mortgage you still need to pay your insurances, you still need to pay your council rates and all of that sort of stuff. You need to know that you can actually afford this property and have an assessment on how long it’s going to take you because obviously the longer it takes you, you’re still paying the mortgage and that’s adding to your costs without any income coming in. When people are purchasing a property to buy and hold and rent out for positive cash flow they tend to look at what their cash on cash return is. What this means is how much cash out of your pocket do you actually invest into this property and what is the return compared to that cash. Most people assess this by looking at the amount of the deposit that they pay. They look at the stamp duty that they paid, they legal fees they pay and then the holding costs and the renovations that they’ve paid and what they don’t look at is the actual value of the mortgage itself. So if you’re getting an 80% loan you’re not actually assessing your income and your return on investment based on that loan amount (though you do that the interest repayments into account). Basically you’re working out all of the costs that you’ll be paying for out of your own money out of your own pocket (not from a loan) and then you’re assessing how much money you’re going to get back from that property. a percentage for your cash on cash return. In the first year your return on investment may not be very good because you don’t have that property rented out.But if in the following year you’re (hopefully) going to get a great return on investments because the rents gone up because you’ve done such a great renovation job. Maybe you end up getting a 20% cash on cash return (maybe that’s something you might be happy with). I don’t know your exact situation but what you would need to do to work out how long is okay to keep your property off the rental market is to work out how much is it actually going to cost me to hold the property for that amount of time without any rent coming in. How much is the extra mortgage repayments going to be, how much is the extra insurance going to be, how much all the extra costs relating to holding that property is going to be. Then you need to work out considering those costs if I can get it done in two months instead of three months how much am I going to save and what is my cash on cash return going to be and how will it affect that? So it’s a more difficult calculation to do and you really need to understand the mathematics behind it. It’s not as easy as you purchase, you flip it and sell it down the track because that’s just an easy assessment. But when you’re renting you’re looking at a cash on cash return and what percentage of cash on cash return you’re going to get and what you’re happy with. The last thing I want to touch on is the potential to access equity after you’ve finished your renovations. There are a lot of lenders out there who will allow you to get your property revalued after you’ve completed your renovation. I always suggest seeing a mortgage broker before you get your loan especially for a renovation because you want to ensure that the lender you’re going with is happy to revalue that property after the renovation is finished. The reason that this can be so valuable is let’s say you purchase a property and for arguments sake let’s say your total cash investment in purchasing your property holding it and renovating it is $100,000 out of your pocket. Let’s say you finish your renovations after 6 months and you now put a tenant in there and rent it out. Whatever return you’re getting will be based off the $100,000 you have as cash invested in that property. What if your property has gone up in value because of the renovations you’ve done? That’s not going to be reflected in the cash on cash return so you’re going to need to do different calculations there. 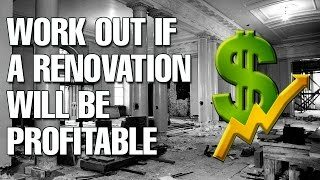 What some people may be inclined to do is if the property has gone up in value and they now have equity that they can access they could effectively borrow that equity for another investment property and therefore get the cash back that they invested to it (or at least a portion of the cash back). Let’s say you invest $100,000 out of your pocket into the property, you do your renovations over 6 months you then rent it out, get it revalued, its gone up quite significantly. Now let’s say you draw $50,000 in equity from that property as a loan to go invest in another property. Well now because you have that $50,000 out really your total cash investment in that property now only stands at $50,000 because you’ve pulled out an extra $50,000. 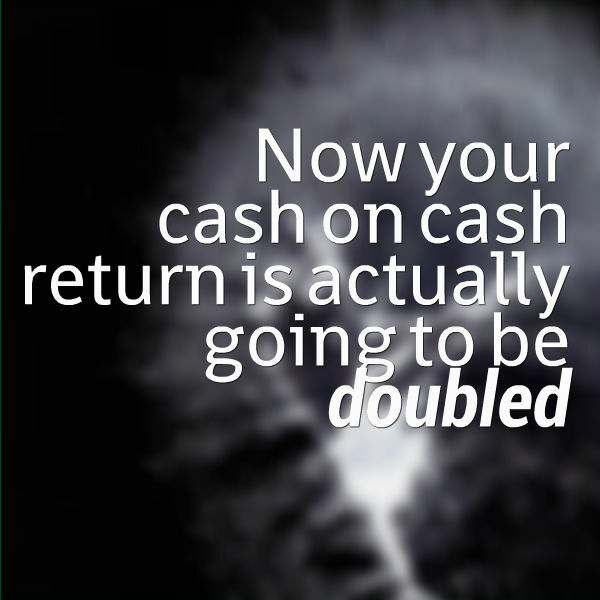 Now your cash on cash return is actually going to be doubled what it was before. If you were to take out $100,000 you would effectively then achieve an infinite return on investment. So as you can see there is a lot of complicated mathematics that goes into working out how long you should keep a property off the market when you’re renovating. Depends on what rental yield you’re going to get, what the cash on cash return is going to be but then there are some fun things that you can do like accessing equity in order to maximise that cash on cash return or you can leave that equity in there but still count it in your calculations making it a valuable investment because eventually down the track you might borrow against it or you might sell that property and access that growth. It’s not really a one size fits all unfortunately and obviously I didn’t have a piece of paper with me, I’m not a mathematician and writing this stuff out would probably be pretty difficult for me but I hope that I communicated that quite effectively and that you have an understanding of some of the things you need to look for when you’re looking at this investment property. I hope this is a stellar investment for you or if you go out there and decide it’s not for you and you’re looking at other properties. I hope that this way of thinking and calculating whether or not it’s going to be a good investment will be helpful for you.